Nonsensible Shoes: Eagles of Death Metal, conservatives. Huh? Eagles of Death Metal, conservatives. Huh? Yesterday I posted about the band The Eagles of Death Metal, the band playing at Le Bataclan club in Paris that was part of the terror attack. I mentioned that I had never heard their music. Listening to it, they are not death metal, they're basically just a rock and roll band. I described their music as harder edged rockabilly but on Wikipedia the refer to them as garage rock. The music is not bad, in fact some of it is catchy. 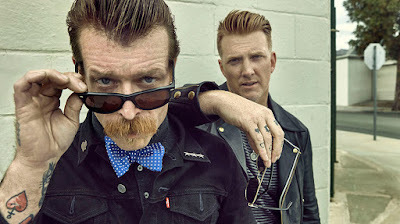 In a 2007 interview, bandmate Josh Homme stated "Jesse Hughes and I have a theory; we’re socially liberal but government conservative guys". Hughes has also said "I wanted to be a Republican politician, for God sakes. I’m a conservative, dude". Homme has described himself as "very conservative politically" and "very socially liberal", considering himself a "fallen libertarian". He owns several guns, including a classic Winchester rifle, a sawed-off shotgun, and a Beretta 9mm target pistol. You never can tell a book by its cover. Kanye West Tried To Get Coachella To Worship On Easter Sunday - Kanye West's Sunday Service had more Kirk Franklin, Otis Redding, and prayer than basic betch Instagram influencer garbage. God is full of mercy, after all. Establishment GOP taking down Trump. Not. More proof Obama just doesn't get it. World War III, or World War I all over again? Who are The Eagles of Death Metal?